For the 1851 treaty, see Treaty of Fort Laramie (1851). 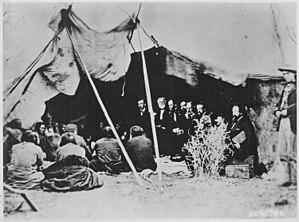 The Treaty of Fort Laramie (also called the Sioux Treaty of 1868) was an agreement between the United States and the Oglala, Miniconjou, and Brulé bands of Lakota people, Yanktonai Dakota, and Arapaho Nation signed in 1868 at Fort Laramie in the Wyoming Territory, guaranteeing to the Lakota ownership of the Black Hills, and further land and hunting rights in South Dakota, Wyoming, and Montana. The Powder River Country was to be henceforth closed to all whites. The treaty ended Red Cloud's War. In the treaty, as part of the U.S. vendetta to "divide and conquer", the U.S. included all Ponca lands in the Great Sioux Reservation. Conflict between the Ponca and the Sioux/Lakota, who now claimed the land as their own by U.S. law, forced the U.S. to remove the Ponca from their own ancestral lands in Nebraska to poor land in Oklahoma. The treaty includes an article intended to "ensure the civilization" of the Lakota, financial incentives for them to farm land and become competitive, and stipulations that minors should be provided with an "English education" at a "mission building." To this end the U.S. government included in the treaty that white teachers, blacksmiths, a farmer, a miller, a carpenter, an engineer and a government agent should take up residence within the reservation. Repeated violations of the otherwise exclusive rights to the land by gold prospectors led to the Black Hills War. Migrant workers seeking gold had crossed the reservation borders, in violation of the treaty. Indians had assaulted these gold prospectors, in violation of the treaty, and war ensued. The U.S. government seized the Black Hills land in 1877. More than a century later, the Sioux nation won a victory in court. On June 30, 1980, in United States v. Sioux Nation of Indians, the United States Supreme Court upheld an award of $15.5 million for the market value of the land in 1877, along with 103 years worth of interest at 5 percent, for an additional $105 million. The Lakota Sioux, however, refused to accept payment and instead demanded the return of their territory from the United States. In more recent proceedings the U.S. Courts have seen that the some of the monies associated with the claim have been expended and, as such, claim that the agreement is valid. In fact, several thousand tribal members have filed for and are awaiting for a final decision by the Court to decide to issue the resources to tribal members. The treaty and its aftermath is the subject of a 1986 video by the Native American Public Broadcasting Consortium. The Lakota Nation holds that James Arthur Ray and the Angel Valley Retreat Center have “violated the peace between the United States and the Lakota Nation” and have caused the “desecration of our Sacred Oinikiga (purification ceremony) by causing the death of Liz Neuman, Kirby Brown and James Shore”. As well, the Lakota claim that James Arthur Ray and the Angel Valley Retreat Center fraudulently impersonated Indians and must be held responsible for causing the deaths and injuries, and for evidence destruction through dismantling of the sweat lodge. The lawsuit seeks to have the treaty enforced and does not seek monetary compensation. The leaders said the ceremony is their way of life and not a religion, as white men see it. It is Native American property protected by U.S. law and United Nations declaration. The ceremony should only be in the hands of sanctioned lodge carriers from legitimate native nations. ↑ "The Treaty of 1868". Native American Public Broadcasting Consortium. 1986. http://www.library.arizona.edu/help/how/find/films/indian/t.html. Retrieved 2012-12-03.